This large building (built at a cost of nearly £4000) has an imposing stone front and tower but brick sides and back. It was designed by John Wills of Derby and built by Mr W. H. Thomas of Oswestry. After several years of fund raising, its foundation stone was laid on 14 June 1891 and it opened on Sunday 6th March 1892. It had space for 500 worshippers, and had 3 vestries at the rear. There is a very detailed description of the chapel at the time of its opening in the "Oswestry Advertiser" of 9th March 1892 on page 6. It replaced the old Baptist chapel on English Walls. There is unfortunately no commemorative stone on this building. The last service held there was on 5 November 1995. 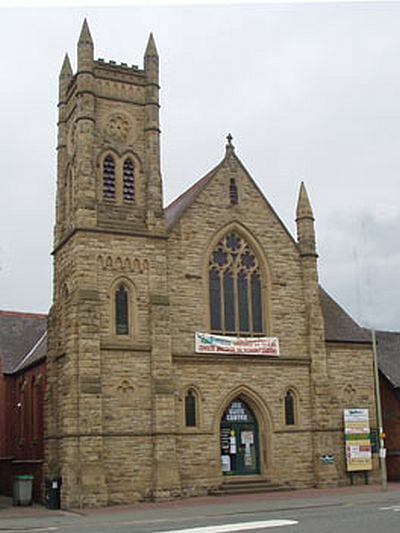 The congregation then met in temporary accommodation "Graylands" in Weston Avenue & when this became too small, they purchased a warehouse & renovated it. The new building, called "Cornerstone", situated at the corner of Lower Brook Street and Roft Street, was opened on 8 June 2002.